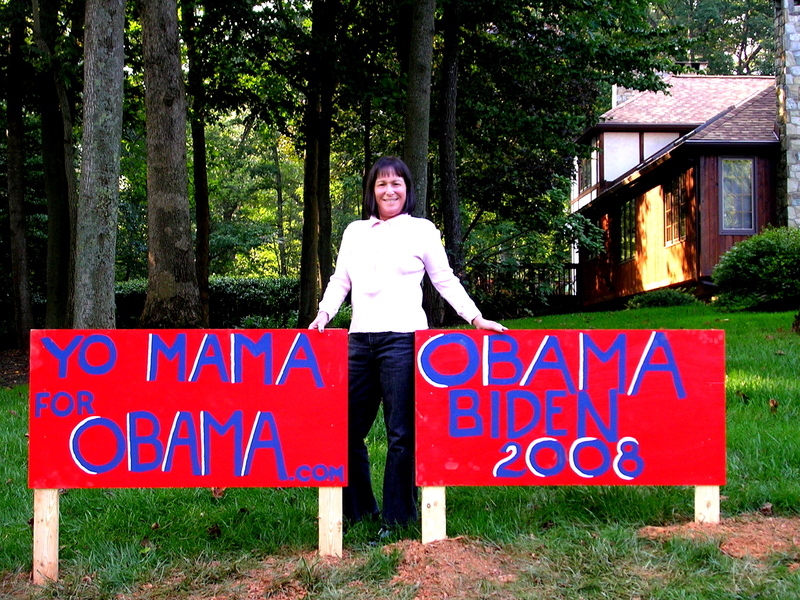 Yo Mama for Obama is a 60-year-old mama of two grown kidz. College grad, M.Ed, teacher, stockbroker and bookkeeper. Of the liberal persuasion politically, but definitely fiscally conservative. Loves the fine arts. Loves to vacuum. A lot. The opportunity we have with Barack Obama has never presented itself before in my lifetime. During the last 4 years (if not longer) I became totally disgusted with all elected politics. However, when Obama arrived, my passion for effectiveness in government, honesty, intellect resurfaced. This man is worth a shot. I can not keep my mouth shut about this. We need him and the times are calling for exactly him. I am an Independent with one issue and one issue only. That issue is health-care costs. I will vote for Obama. McCain’s solution, at least to me, is a joke. you go mama! i am voting obama. You are an absolute moron! Take your half-breed and all the other liberal, democrat, pole-smoking fags and go straight to hell!!! 2. Apparently you are already living in your own misanthropic Hell.